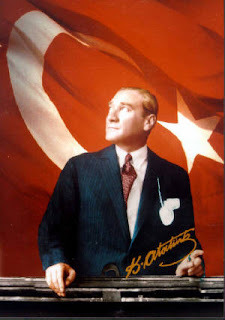 Turkey lost Ataturk, the man who has made Turkey the country it is, in 1938 on this day. He died at 9:05 am, and the entire country stops what they're doing at that time exactly, stands up for a minute of silence for his respect. When I was in Kuwait, I remember my mom opening the Turkish news and the entire country stops, the cars stop, people stop what they're doing, the boats stop, people honk and there's a loud horn that can be heard where ever you are. Honestly, I don't know where or what I was doing at 9:05 am on November 10 for the past 3 years. I always wanted to see it, and be a part of it. Today, I was getting ready to go to my friends place early in the morning, and I looked at the time at it was like 9:12 and I was thinking if I didn't hear it, like all the other years. But my clock is ahead a few minutes, and just as I was leaving my room I heard a loud horn and I looked outside and wow. I live on campus so there isn't many people around, expecially at that time. But I saw some students who were walking to class, and they just stopped for as long as the horn was on for and I got goosebumps and I got so emotional, I really don't know why? Maybe it was becuase it was my first time actually seeing it, and kind of being a part of it. I stopped and stood still as well, it's the only thing I could have done to pay Ataturk my repsect. After the horn stopped, people continued what they were doing, and I just started crying. In fact, as I'm writing this, my eyes started to tear up. Even when people are gathered around saying the Turkish national anthem, I get extremely emotional. Last time was at my sisters graduation. Man, that was crazy as well. Everyone first stood up for a minute of silence for Ataturk, and then said the anthem in union, and I get this very different feeling. Maybe it's because I lived in a culture that didn't belong to me, and now, finally, having the chance to be in my culture? I don't know. It's a complicated, sensitive, and emotional topic. Rest in peace, Ataturk. Turkiye loves you. What does your country do in such cases?